The database "Human rights of persons with disabilities" was born from a collaboration between the Consiglio Nazionale sulla Disabilità (National Disability Council - CND), the Human Rights Centre of the University of Padua and Disabled People’s International (DPI). Its development was accomplished by the CND while it was partner of the European Community 6th Framework MURINET Project (Multidisciplinary Research Network on Health and Disability in Europe - http://www.murinet.eu/). 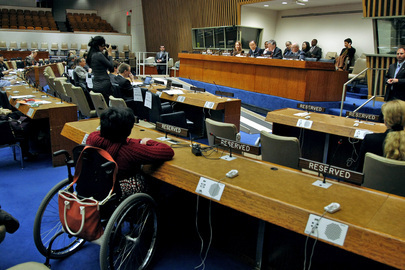 It focuses on Human Rights and Disability, and is organised by a list of subjects, based on the UN Convention on the Rights of Persons with Disabilities (CRPD): accessibility; awareness raising; children; education; equality and non-discrimination; freedom from torture, cruel/ inhuman/ degrading treatment and exploitation, violence and abuse; habilitation and rehabilitation; health; independent living and inclusion in community; liberty and security; participation; right to life; situations of risk and humanitarian emergencies; statistics and data collection; women; work and employment. Although most of the documentation is available in English only, the database provides the possibility to choose the language of the documents to be searched (English, Italian and others). The database also has searchable keywords such as: advocacy, barriers, Community Based Rehabilitation (CRB), discrimination, empowerment, environment, ethics, gender, inclusion, law and legislation, mainstreaming, NGOs, research, amongst many others… that should help to navigate and easily find what is needed. The database aims at providing access to many downloadable documents, namely relevant recommendations and policy documents by European and International bodies such as the Council of Europe (CoE), the International Labour Organisations (ILO), the European Community (EC), the European Agency for the Development of Special Needs Education (EADSNE) amongst others. On the other hand, the database also provides access to many publications by disabled persons’ organisations such as the European Disability Forum, Disabled peoples’ International, Leonard Cheshire, Inclusion Europe. Finally, the aim of the database is to move towards more inclusive societies where all can participate by raising awareness and building bridges between policy and practice.